December 18, 2008 Columbia Journalism Review: "NYT Putting It All Together on Wall Street Pay"
For Dow Kim, 2006 was a very good year. While his salary at Merrill Lynch was $350,000, his total compensation was 100 times that — $35 million. The difference between the two amounts was his bonus, a rich reward for the robust earnings made by the traders he oversaw in Merrill’s mortgage business. Mr. Kim’s colleagues, not only at his level, but far down the ranks, also pocketed large paychecks. In all, Merrill handed out $5 billion to $6 billion in bonuses that year. A 20-something analyst with a base salary of $130,000 collected a bonus of $250,000. And a 30-something trader with a $180,000 salary got $5 million. Even Wall Streeters concede they were dazzled by the money. To earn bigger bonuses, many traders ignored or played down the risks they took until their bonuses were paid. Their bosses often turned a blind eye because it was in their interest as well. “That’s a call that senior management or risk management should question, but of course their pay was tied to it too,” said Brian Lin, a former mortgage trader at Merrill Lynch. The highest-ranking executives at four firms have agreed under pressure to go without their bonuses, including John A. Thain, who initially wanted a bonus this year since he joined Merrill Lynch as chief executive after its ill-fated mortgage bets were made. And four former executives at one hard-hit bank, UBS of Switzerland, recently volunteered to return some of the bonuses they were paid before the financial crisis. But few think others on Wall Street will follow that lead. For now, most banks are looking forward rather than backward. Morgan Stanley and UBS are attaching new strings to bonuses, allowing them to pull back part of workers’ payouts if they turn out to have been based on illusory profits. Those policies, had they been in place in recent years, might have clawed back hundreds of millions of dollars of compensation paid out in 2006 to employees at all levels, including senior executives who are still at those banks. The bonanza redefined success for an entire generation. Graduates of top universities sought their fortunes in banking, rather than in careers like medicine, engineering or teaching. Wall Street worked its rookies hard, but it held out the promise of rich rewards. In college dorms, tales of 30-year-olds pulling down $5 million a year were legion. Pay was tied to profit, and profit to the easy, borrowed money that could be invested in markets like mortgage securities. As the financial industry’s role in the economy grew, workers’ pay ballooned, leaping sixfold since 1975, nearly twice as much as the increase in pay for the average American worker. Dow Kim stepped into this milieu in the mid-1980s, fresh from the Wharton School at the University of Pennsylvania. Born in Seoul and raised there and in Singapore, Mr. Kim moved to the United States at 16 to attend Phillips Academy in Andover, Mass. A quiet workaholic in an industry of workaholics, he seemed to rise through the ranks by sheer will. After a stint trading bonds in Tokyo, he moved to New York to oversee Merrill’s fixed-income business in 2001. Two years later, he became co-president. Even as tremors began to reverberate through the housing market and his own company, Mr. Kim exuded optimism. After several of his key deputies left the firm in the summer of 2006, he appointed a former colleague from Asia, Osman Semerci, as his deputy, and beneath Mr. Semerci he installed Dale M. Lattanzio and Douglas J. Mallach. Mr. Lattanzio promptly purchased a $5 million home, as well as oceanfront property in Mantoloking, a wealthy enclave in New Jersey, according to county records. Merrill and the executives in this article declined to comment or say whether they would return past bonuses. Mr. Mallach did not return telephone calls. Mr. Semerci, Mr. Lattanzio and Mr. Mallach joined Mr. Kim as Merrill entered a new phase in its mortgage buildup. That September, the bank spent $1.3 billion to buy the First Franklin Financial Corporation, a mortgage lender in California, in part so it could bundle its mortgages into lucrative bonds. Yet Mr. Kim was growing restless. That same month, he told E. Stanley O’Neal, Merrill’s chief executive, that he was considering starting his own hedge fund. His traders were stunned. But Mr. O’Neal persuaded Mr. Kim to stay, assuring him that the future was bright for Merrill’s mortgage business, and, by extension, for Mr. Kim. Mr. Kim stepped to the lectern on the bond trading floor and told his anxious traders that he was not going anywhere, and that business was looking up, according to four former employees who were there. The traders erupted in applause. Merrill Lynch celebrated its success even before the year was over. In November, the company hosted a three-day golf tournament at Pebble Beach, Calif.
Mr. Kim, an avid golfer, played alongside William H. Gross, a founder of Pimco, the big bond house; and Ralph R. Cioffi, who oversaw two Bear Stearns hedge funds whose subsequent collapse in 2007 would send shock waves through the financial world. “There didn’t seem to be an end in sight,” said a person who attended the tournament. Back in New York, Mr. Kim’s team was eagerly bundling risky home mortgages into bonds. One of the last deals they put together that year was called “Costa Bella,” or beautiful coast — a name that recalls Pebble Beach. The $500 million bundle of loans, a type of investment known as a collateralized debt obligation, was managed by Mr. Gross’s Pimco. Merrill Lynch collected about $5 million in fees for concocting Costa Bella, which included mortgages originated by First Franklin. But Costa Bella, like so many other C.D.O.’s, was filled with loans that borrowers could not repay. Initially part of it was rated AAA, but Costa Bella is now deeply troubled. The losses on the investment far exceed the money Merrill collected for putting the deal together. By the time Costa Bella ran into trouble, the Merrill bankers who had devised it had collected their bonuses for 2006. Mr. Kim’s fixed-income unit generated more than half of Merrill’s revenue that year, according to people with direct knowledge of the matter. As a reward, Mr. O’Neal and Mr. Kim paid nearly a third of Merrill’s $5 billion to $6 billion bonus pool to the 2,000 professionals in the division. Mr. O’Neal himself was paid $46 million, according to Equilar, an executive compensation research firm and data provider in California. Mr. Kim received $35 million. About 57 percent of their pay was in stock, which would lose much of its value over the next two years, but even the cash portions of their bonus were generous: $18.5 million for Mr. O’Neal, and $14.5 million for Mr. Kim, according to Equilar. Mr. Kim and his deputies were given wide discretion about how to dole out their pot of money. 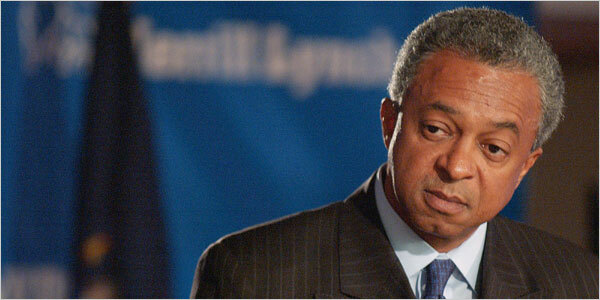 Mr. Semerci was among the highest earners in 2006, at more than $20 million. Below him, Mr. Mallach and Mr. Lattanzio each earned more than $10 million. They were among just over 100 people who accounted for some $500 million of the pool, according to people with direct knowledge of the matter. After that blowout, Merrill pushed even deeper into the mortgage business, despite growing signs that the housing bubble was starting to burst. That decision proved disastrous. As the problems in the subprime mortgage market exploded into a full-blown crisis, the value of Merrill’s investments plummeted. The firm has since written down its investments by more than $54 billion, selling some of them for pennies on the dollar. Mr. Lin, the former Merrill trader, arrived late to the party. He was one of the last people hired onto Merrill’s mortgage desk, in the summer of 2007. Even then, Merrill guaranteed Mr. Lin a bonus if he joined the firm. Mr. Lin would not disclose his bonus, but such payouts were often in the seven figures. Mr. Lin said he quickly noticed that traders across Wall Street were reluctant to admit what now seems so obvious: Their mortgage investments were worth far less than they had thought. But critics question why Wall Street embraced the risky deals even as the housing and mortgage markets began to weaken. “What happened to their investments was of no interest to them, because they would already be paid,” said Paul Hodgson, senior research associate at the Corporate Library, a shareholder activist group. Some Wall Street executives argue that paying a larger portion of bonuses in the form of stock, rather than in cash, might keep employees from making short-sighted decision. But Mr. Hodgson contended that would not go far enough, in part because the cash rewards alone were so high. Mr. Kim, for example, was paid a total of $116.6 million in cash and stock from 2001 to 2007. Of that, $55 million was in cash, according to Equilar. As the damage at Merrill became clear in 2007, Mr. Kim, his deputies and finally Mr. O’Neal left the firm. Mr. Kim opened a hedge fund, but it quickly closed. Mr. Semerci and Mr. Lattanzio landed at a hedge fund in London. All three departed without collecting bonuses in 2007. Mr. O’Neal, however, got even richer by leaving Merrill Lynch. He was awarded an exit package worth $161 million. Clawing back the 2006 bonuses at Merrill would not come close to making up for the company’s losses, which exceed all the profits that the firm earned over the previous 20 years. This fall, the once-proud firm was sold to Bank of America, ending its 94-year history as an independent firm. Mr. Bebchuk of Harvard Law School said investment banks like Merrill were brought to their knees because their employees chased after the rich rewards that executives promised them. “They were trying to get as much of this or that paper, they were doing it with excitement and vigor, and that was because they knew they would be making huge amounts of money by the end of the year,” he said. A version of this article appeared in print on December 18, 2008, on page A1 of the New York edition.